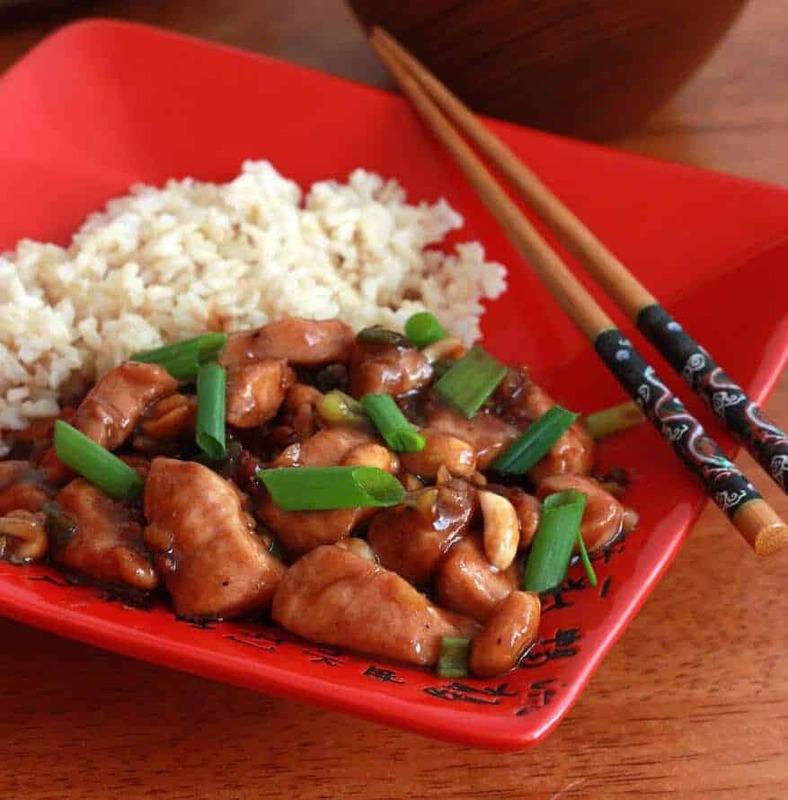 Originating in the Sichuan Province of China, Kung Pao Chicken is a popular dish throughout China and the Western world. It is believed to have been named after the governor of Sichuan, Ding Baozhen of the Qing Dynasty. His official title, Gong Bao (meaning “palatial guardian”), is thought to have inspired the name of the dish. The name continued until the Cultural Revolution when any association with Ding Baozhen became politically incorrect. Thus, the name of the dish was changed to simply “fast-fried chicken cubes” or “chicken cubes with seared chiles” until the 1980′s when the political climate cooled and it’s original name was reclaimed. The key component to authentically-tasting Kung Pao is the use of whole sichuan peppercorns. Commonly used in authentic Asian cuisine but not as often found in Americanized Chinese cooking. Not actually a peppercorn or even related to the pepper family at all, the sichuan peppercorn is actually part of the citrus family and its flavor bears some subtle nuances to its genus. It is one of the ingredients in Chinese Five Spice Powder, and is also traditionally used in Chinese medicine. 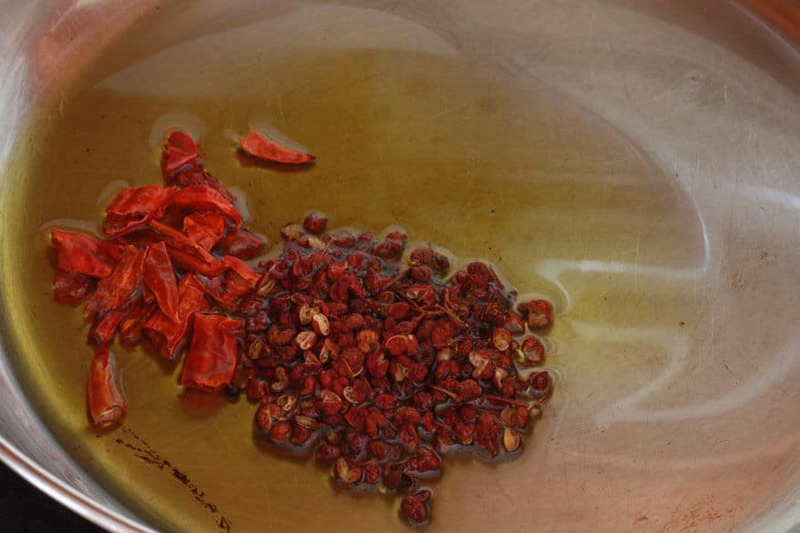 Though used in the traditional Chinese versions of the recipe, sichuan peppercorns are not commonly used in Americanized versions. This is due to the fact that the sichuan peppercorn was banned from importation to the U.S. from 1968 until 2005, because it was viewed as a potential carrier of “citrus canker,” a tree disease that can potentially harm citrus crops. The ban was lifted in 2005 and we now have access to this distinct and delicious ingredient. Highly flavorful and aromatic, sichuan peppercorns impart a tingling numbness that enriches fiery tastes. 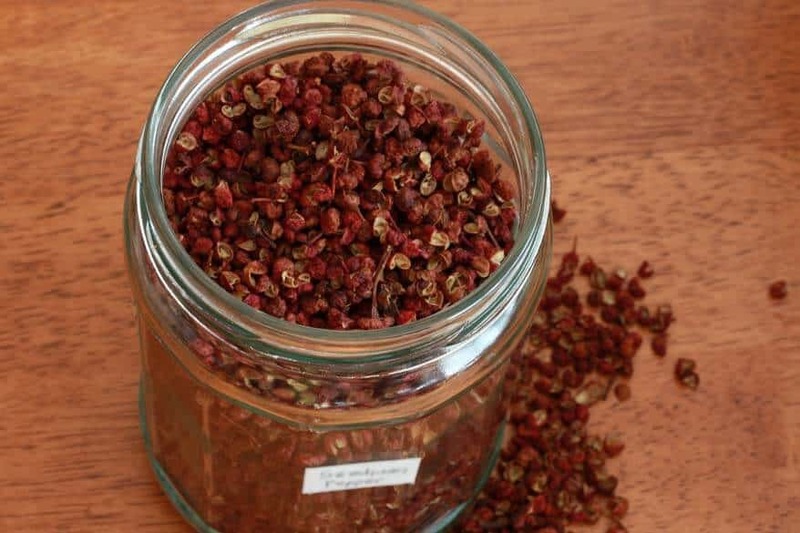 Look for sichuan peppercorns in your local Chinese market or order it online. There is a reason why this dish is such such a popular Chinese staple in North America. It’s delicious! 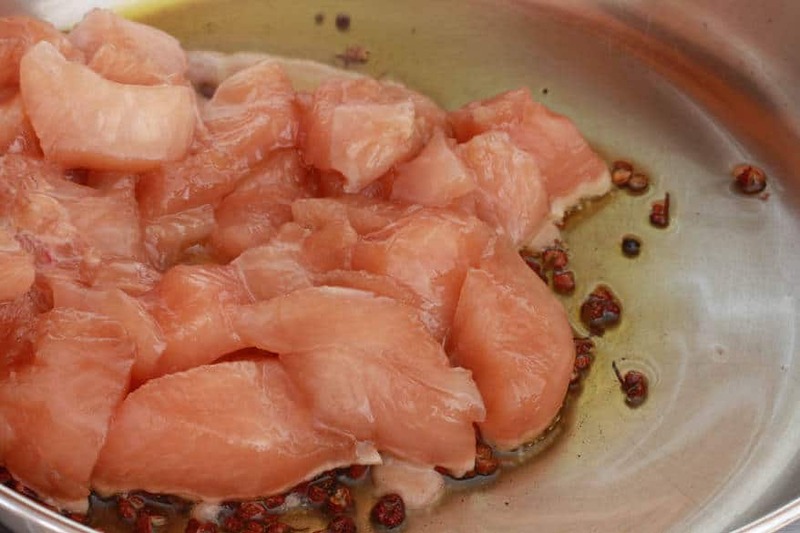 Combine the chicken with the marinade ingredients and let sit at room temperature for about 10 minutes. 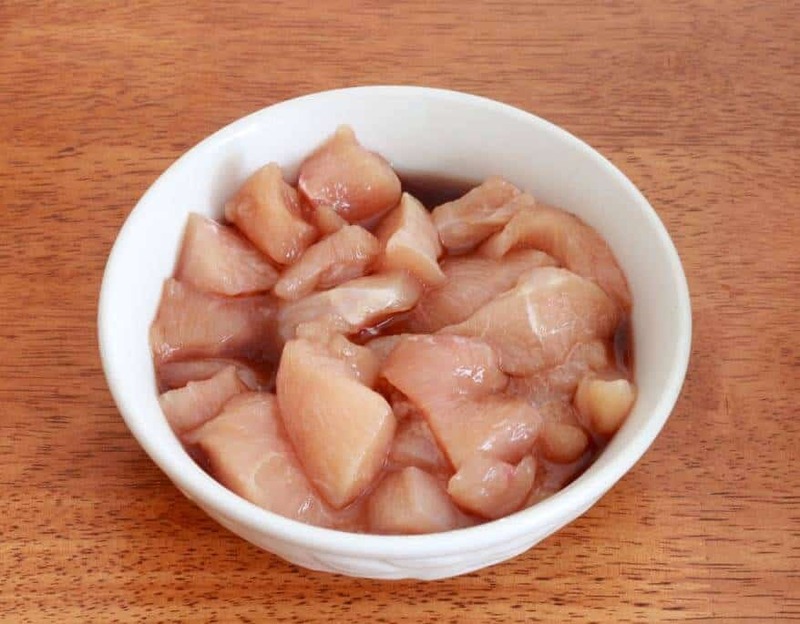 Combine all the sauce ingredients in a bowl (the following can be easily found and purchased online here: Hoisin Sauce, Chinese Rice Wine, Chinese Black Vinegar, Sesame Oil. Here is what the sichuan peppercorns look like. You’ll need about 1 1/2 tablespoons. The is no substitute for it’s flavor. Heat the oil in a wok or skillet over high heat and, once the oil is hot, briefly fry the sichuan peppercorns and broken up chilies, about 15 seconds. Add the chicken and fry until no longer pink. Have the green onions, garlic and ginger chopped and ready to add. Add the garlic, ginger, and white parts of the green onions (the whites take longer to cook and you want to avoid the green parts getting too soggy). Fry for another 30 seconds. Add the peanuts and toss to combine. Pour in the sauce and stir until thickened, about 30 seconds. Add the green onions and stir to combine. 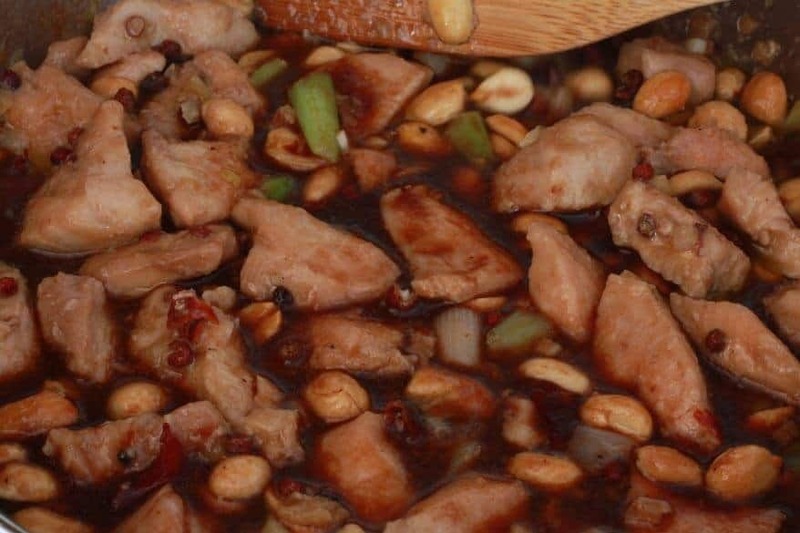 The luscious Kung Pao Chicken is ready to eat! Serve immediately with some steamed rice. Note: See bottom of recipe for a vegetarian/vegan version. In a medium bowl, stir together the soy sauce, rice wine, and cornstarch until the cornstarch is dissolved. Add the chicken and toss to coat and let it marinate for at least 10 minutes. 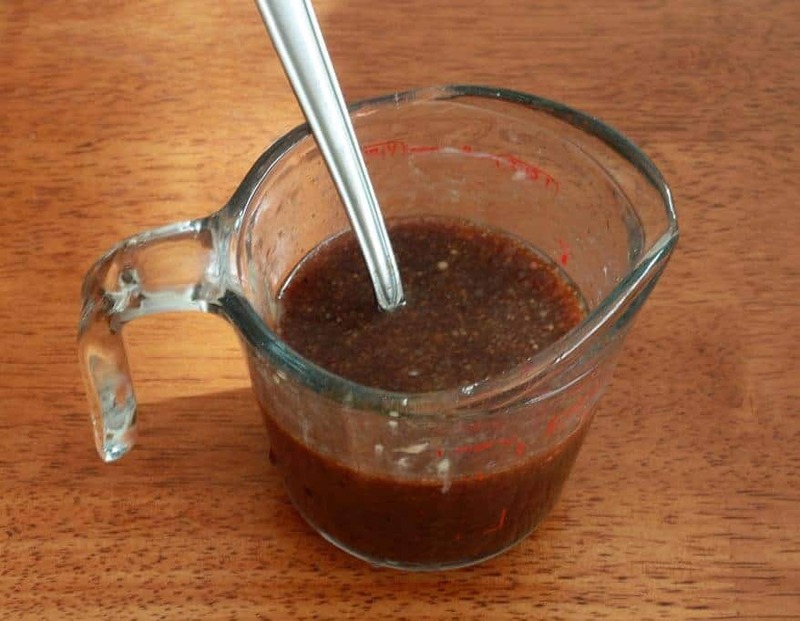 In a small bowl, combine the vinegar, soy sauce, hoisin sauce, sesame oil, sugar, and cornstarch. Stir until the sugar and cornstarch are dissolved. Set aside. Heat a wok or large skillet over high heat until a drop of water sizzles when thrown in. Add the oil and coat the bottom of the pan. Add the chilies and sichuan peppercorns and stir-fry for 30 seconds until the chilies begin to darken in color. Add the marinated chicken and stir-fry until no longer pink. 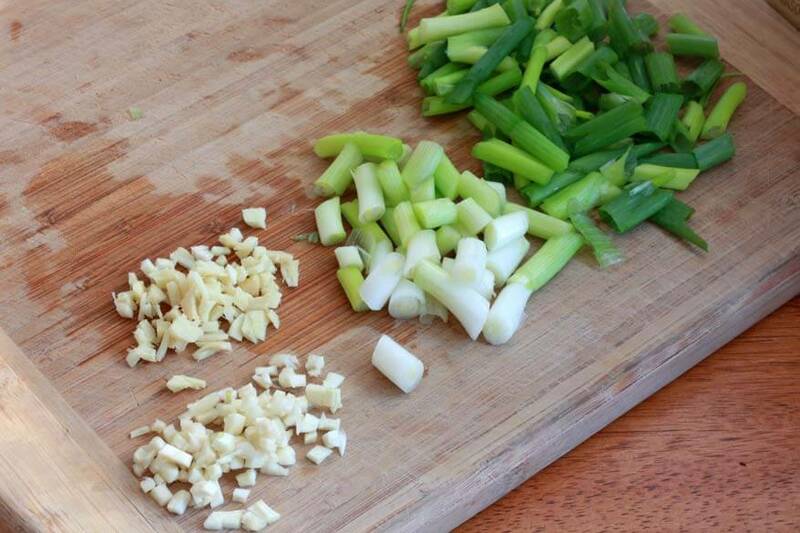 Add the white parts of the green onion along with the garlic and ginger and stir-fry for another 30 seconds. Pour in the sauce and stir, coating the chicken. Add the peanuts, stir to coat, and cook for another 2 minutes. Transfer to a dish, sprinkle the green parts of the green onions on top, and serve immediately with rice. Thank you for the compliment, Penny. I’m honored to be part of your March menu line-up and look forward to seeing what other goodies you include. Thanks for visiting. Fantastic, aderline!! So thrilled it was a success and thanks for the feedback! My husband loved this so much that I made it twice in the same weekend. I have tried quite a few Asian recipes, but this is the best ever! Thanks so much! I made this dish tonight. It was fantastic to say the least. We served it with rice and stir fried sweet peppers and I made a papaya coconut whip for dessert. it was a really nice gluten free menu. Thanks for the Asian peppercorn explanation. Fantastic, so happy to hear it was a hit! The papaya coconut whip sounds like the perfect follow-up to a spicy meal. My family did not like this recipe. Sorry you didn’t like it, EH. 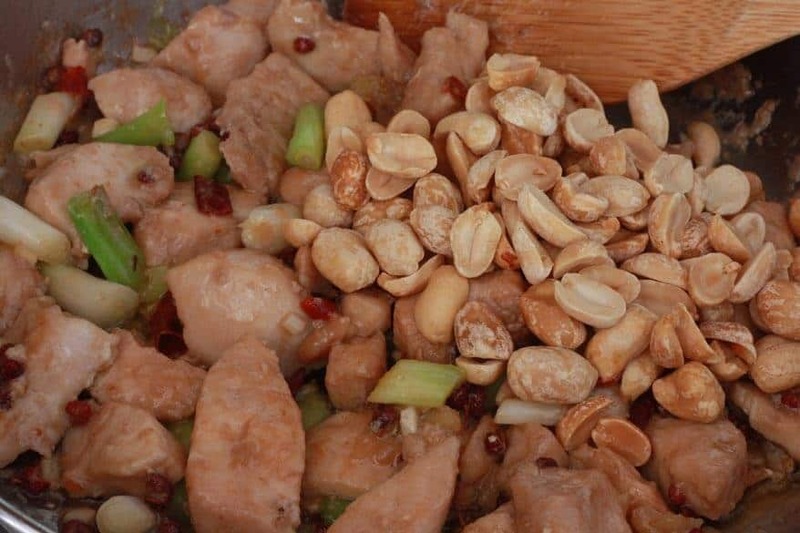 Have you had kung pao chicken before so you’d know what to expect? This is very similar to what you’ll find in the best Chinese restaurants and many readers have told me it’s even better. It’s one of our favorites. But it is very spicy! It looks delicious, but could you please tell me how many calories there would be per serving? Since I’m currently on a weight loss plan, it would be helpful to know the nutrition information. Thank you! Hi Nikki, I haven’t calculated that information but there are several sites, like fitday.com, where you can enter the ingredients and it gives you the nutritional breakdown. If you’re on a weight loss program though I wouldn’t recommend this or anything with a good amount of sugar in it. 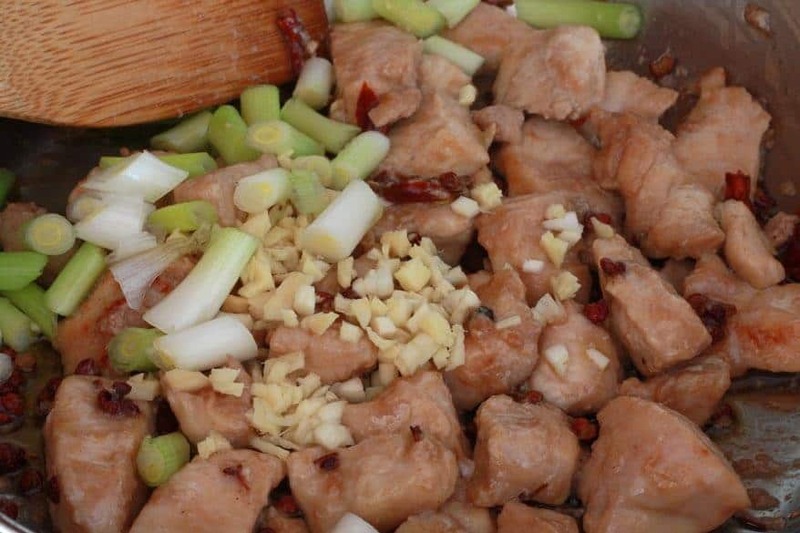 Looks pretty awesome but, you’re missing one key step in making it authentic and delicious – velveting the chicken meat before stir-frying. You do that, this becomes godly. Velveting is rather godly, I agree! :) I velvet the chicken in my Chinese Orange Chicken but most Kung Pao I’ve seen in restaurants and have had served by Chinese friends isn’t velveted. It’s probably just a matter of personal preference. How crazy easy awesome is this?!! I know, right?? Chinese stir-fries are the BEST because they’re so fast and taste soooo good! I love a good stir-fry. 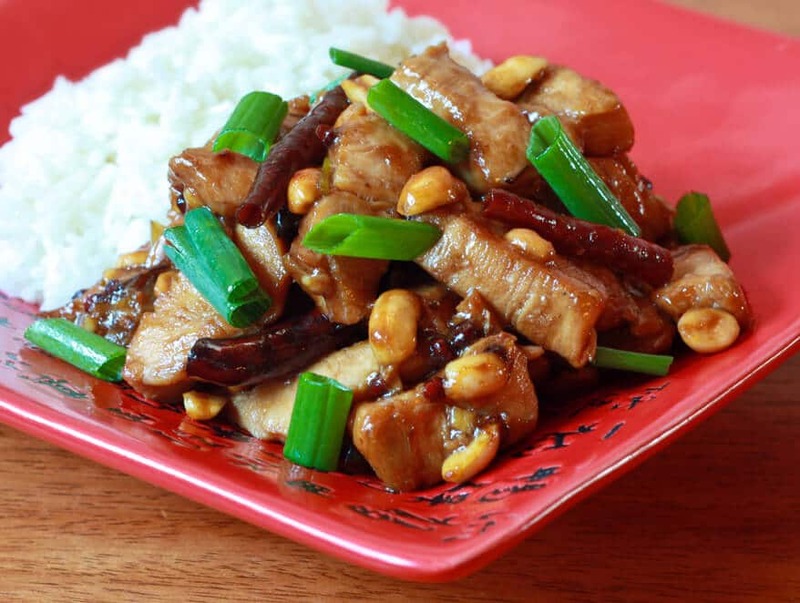 Kung Pao is one of our favorites! Looks delicious! Thanks, Cynthia! This is probably the Chinese dish my husband requests the most. 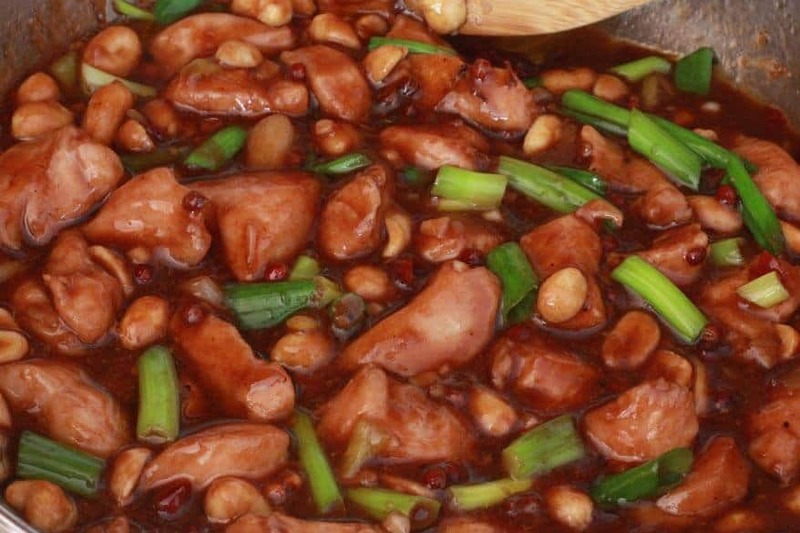 I love kung pow chicken but never thought to make at home or even look up a recipe. Guess I’ll start with this one! Scrumptious! This is so quick and easy – and I love that when you prepare it at home you can really control what goes into it! Much best than take-out! I also love that you offer a vegetarian option – so flexible and adaptable! Exactly, Shelley, it’s so nice being able to eat and fully enjoy it without the worry of “what all is really in this? ?” And it honestly tastes way better than takeout, too! I love learning food history and fun facts. The information about the peppercorn is so dang interesting. I must try now! Thank you for sharing! Thanks, Steph! 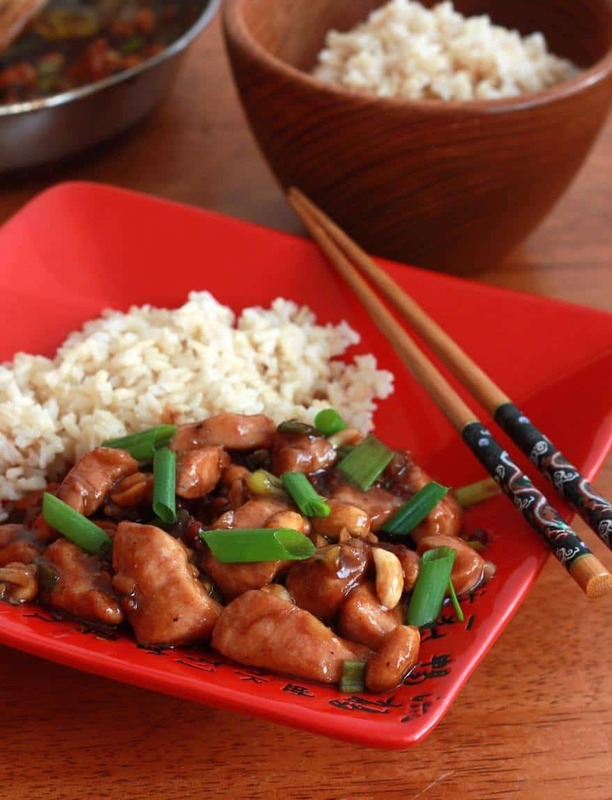 You’ll love this Kung Pao! I love me some stir fry! I’m going to try this this week! This looks so delicious! I would love to have some right now! I love making some of my take-out favorites at home! They’re healthier and they usually taste so much better than take-out! This looks delicious – I love that punch (PAO!) of flavor going on! Thanks, Faith! I agree, they’re healthier AND taste better, plus they’re just so darn easy to make so it’s a win-win all around! 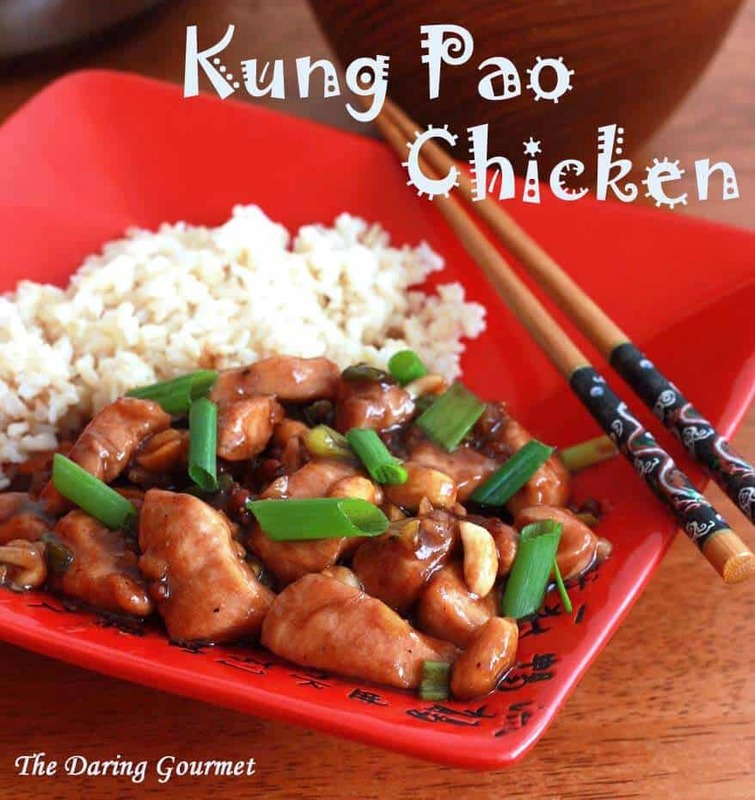 I loved learning about the history of Kung Pao Chicken and how authentic this recipe is. Cannot wait to try it. I’ve never used Szechuan Peppercorns before, but now I’m totally intrigued and will be on the lookout for them the next time I go to the Asian grocery store! And your Kung Pao Chicken looks great too! Thanks, Sheena! They’re unlike any other flavor, truly unique, and they add such an interesting flavor dimension to the dishes. A ban on peppers?!?!? Say it isn’t so! I am so glad that I was not alive then or I would have gone insane! I love spicy peppers! This is a great alternative to take out and no MSG! Haha, Jennifer! I know, we’re super fortunate :) And agreed, SO much better than takeout! It’s super good, Maryanne, I’m not surprised it was among the most popular! I’m definitely skipping take out and making this dish at home! That’s the spirit, Deb, awesome! This looks and sounds scrumptious!! What color, spice and flavor. Yum! Thanks, Anna, it’s one of our favorites! I agree, Erin, I’m always fascinated to research and learn the history of dishes – somehow it just makes eating them even more enjoyable :) The sichuan peppercorns definitely add a unique flavor dimension. If I made this for dinner, I would have one happy hubby and think I am the wife of the year ;) Looks so darn good! This is exactly what I want for dinner tonight, yum! I didn’t have rice wine so I added rice wine vinegar. I didn’t have black vinegar so I use balsamic vinegar. The flavor was to stron. I thing I wold prefer kam po chicken with a light sauce. Hi Toni, thanks for the feedback. Rice wine and rice wine vinegar are two totally different things. You essentially doubled up on the vinegar, so that would explain why it was too strong. This looks so fantastic, I love it take-IN is the way to go! I am making this for dinner sometime this week! This was my favorite go-to meal in Chinese restaurants when I was younger. You did a fantastic job making a homemade recipe for people to follow. I’ve turned to your recipe so many times now! Thank you so very much! Thank YOU, Cece, I’m so happy to hear that! This recipe looks really simple! I seriously think I could make it at home for my family! This chicken looks fantastic. Lots of flavor and totally yummy! You make this sound so easy. I’ve been wanting to try making my own Chinese food instead of getting takeout, so I need to try this soon! Ah! 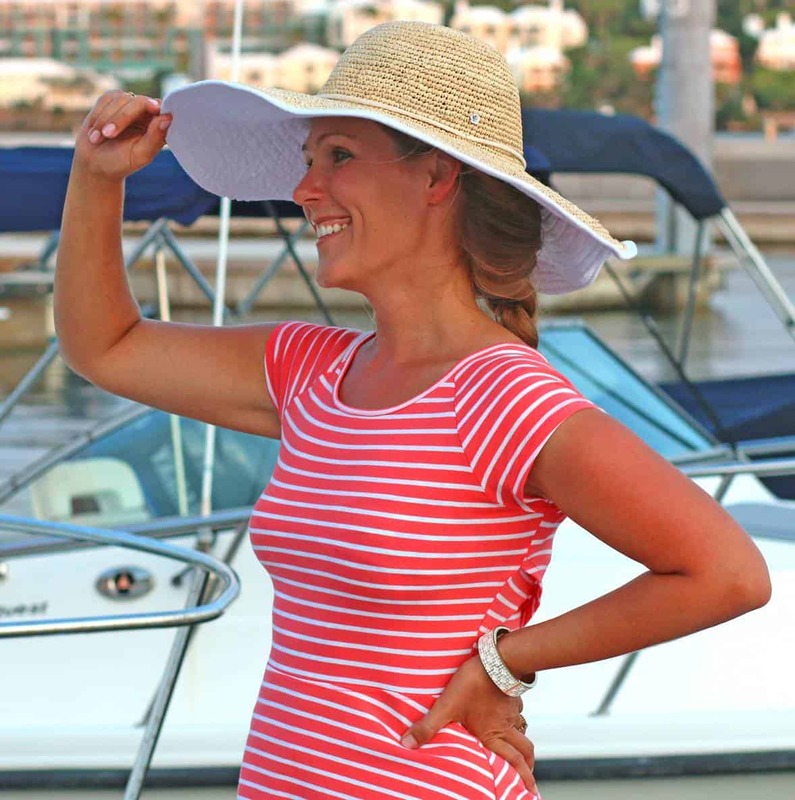 One of my favorites – can’t wait to try your recipe! I’ll never have to order takeout again!! I’m sold. I felt like Smaug after eating this dish. Maybe it is because I got the peppercorns and chilies from an Asian market. I love spicy but it was too hot even for me. That said, it was great! I’d recommend halving the spices. Hi Josh, yes, Kung Pao is traditionally a very hot dish! I’m a bit wimpy when it comes to overly hot foods so I cut back on the chilies when I’m making it as well. 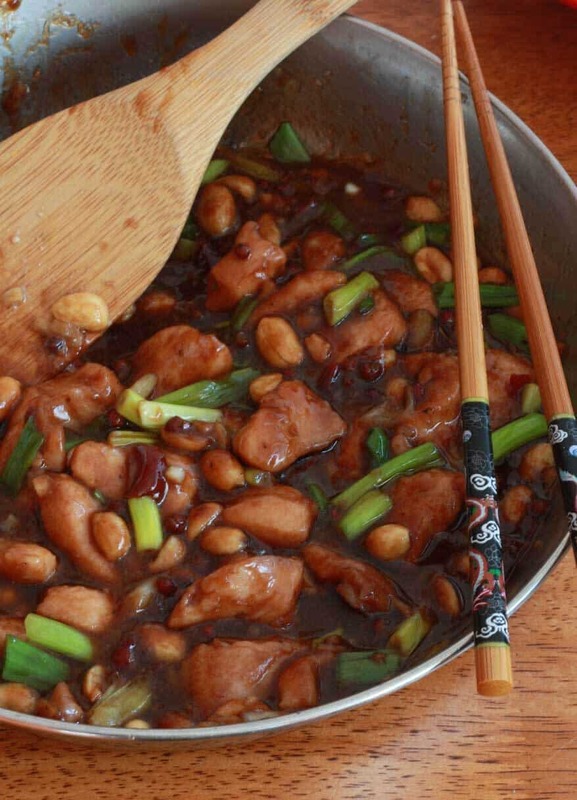 Hi There, just been looking at you Kung Pao and Hot and Sour Soup recipes and must say both of them look very good. I have made both dishes in the past using recipes from Ken Hom’s Book, “Chinese Technique” and from memory the ingredients and style are very similar. 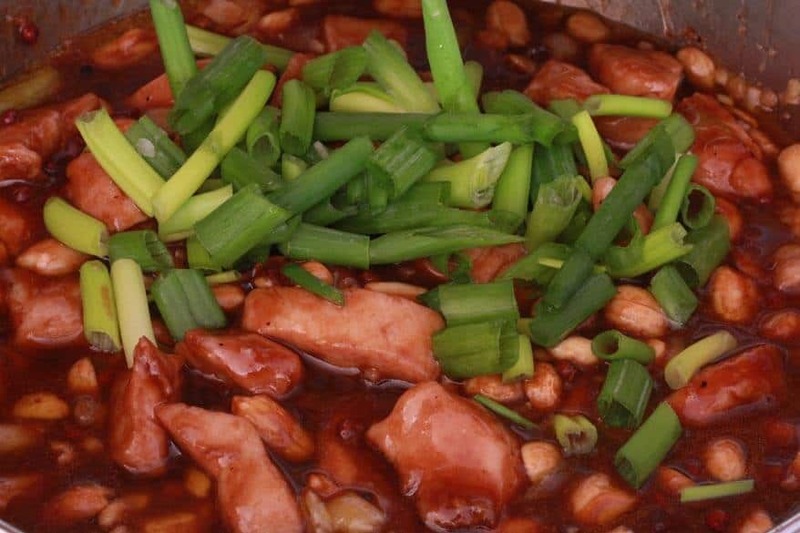 Do you have a recipe for Shredded Pork in Garlic Sauce? as this is another favourite of mine. Hi Graeme, thank you. I don’t have a recipe for Shredded Pork in Garlic Sauce yet, but that’s a very good idea :) I’m a huge Chinese food fan as well. There’s rarely a time that I’m not in the mood for it. This recipe looks great but I’m a little nervous about leaving the whole peppercorns in. I LOVE the flavor and numbing of the peppercorns, but don’t want to bite into one. Any tips or advice on this? Thanks! Hi Emmie, if you prefer you can grind them instead. Either in a spice/coffee grinder or just put them in a plastic baggie and smash them.